(APN) ATLANTA — There has been no progress to date on amending the Community Benefits Agreement for the catalytic Westside Yards Development proposed for Atlanta’s English Avenue neighborhood, following a thirty day deferral by the City of Atlanta agreed to by developer Echo A, which includes Brock Built Homes. 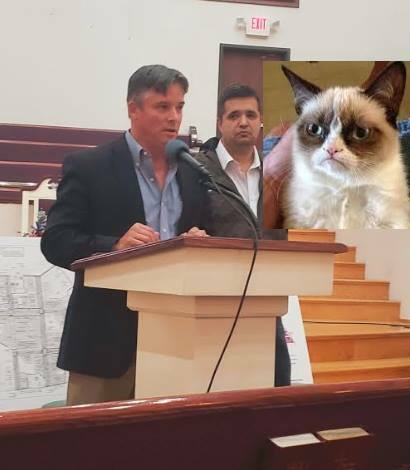 Developer Adam Brock insisted, “I won’t be called a racist!” as he began storming out of a so-called community input meeting held on Thursday, August 02, 2018 at the Lindsay Street Baptist Church. Mr. Brock had already showed no interest in hearing from the community, having already packed his bags midway through the question and answer session. Atlanta Progressive News had asked a question about affordable housing. “Look at the alternatives that are laid out in the Inclusionary Zoning ordinance. Cause you’re saying it requires fifteen percent of the units at 80 [percent of the Area Median Income]. No, there are options,” APN’s News Editor said. “You could have 15 percent at 80. You could do 10 percent at 60. Why don’t you want to do 60?… You can do fewer units at a deeper level of affordability. The math works out usually the same… It’s not gonna cost you much,” APN’s News Editor said. “So why wouldn’t you want to use the option that’s already in the law to get to the lower level of affordability if it’s not going to cost you anything more, unless it has to do with classism, racism, discrimination?” APN asked. This is when Brock began storming out of the room. “He’s not calling you a racist. He’s not calling you a racist. You don’t have to leave,” Councilman Ivory Young (District 3) said, inviting the present reporter to clarify. “If there are specific questions related to affordability, if you could respond to those,” Councilman Young said to Brock. “I have no evidence of his intent, what I’m saying is I don’t know why he wouldn’t go 60 percent,” the present reporter clarified. Neither Brock nor developer Wesley deFoor ever answered the question. On July 02, 2018, Councilman Young had announced at the Full Council Meeting that the developer had agreed to a thirty day deferral to get more community input, even after their requested Zoning and Land Use change had already passed both the Zoning Committee and the Community Development/Human Services Committees. As previously reported by APN, a group of residents calling themselves the English Avenue Neighborhood Association [there is a dispute about who is the rightful EANA] has created a Community Benefits Agreement (CBA) with the developer. State Rep. “Able” Mable Thomas (D-Atlanta) has convened a group of concerned stakeholders and conducted numerous community input meetings regarding the development, to draft several suggested changes to the CBA. Rep. Thomas held a meeting on Saturday, July 14, 2018, with approximately one hundred attendees, at the Faith Hope Deliverance Temple. Residents are generally horrified by the potential for gentrification in their community, because they correctly perceive that Westside Yards could spur more development and cause their rents to go up. Residents have expressed concern regarding the lack of meaningful affordable housing units in the development. The developer agreed to satisfy the City’s Inclusionary Zoning requirements for the Westside Overlay by providing 15 percent of the 650 housing units at 80 percent of the AMI, and, as part of the CBA, to provide an additional five percent, also at 80 percent of the AMI. The proposal seeks that the IZ units be provided at 60 percent AMI instead of 80; that additional affordable units be provided at lower levels of AMI; that a certain percentage of the construction jobs and permanent jobs be set aside for English Avenue and Vine City residents; that the developer install solar panels and provide fruit trees; and other benefits. English Avenue resident Stephen Causby explained that the proposed Westside Yards development–even with the announcement by the developer to abandon its request for an eleventh story–is not consistent with the Westside Land Use Framework Plan. Also, resident Tony Torrence showed historical maps demonstrating that the developer is proposing to build in a floodplain in a wetland area. Following its agreement to conduct 30 days of public input, the developer has now hosted two meetings, which were both carefully managed and controlled, and did not allow for meaningful negotiation. In fact, Councilman Young distributed a document at the first public input meeting that he said had been authored by the City’s Planning Department, that apparently sought to shut down any conversation about amending the CBA. “It is impermissible for municipalities to require zoning applicants to enter CBA’s with neighborhoods in return for approval of rezoning,” the document states, citing a Supreme Court of Georgia case, Cross v. Hall County (1977). However, Cross v. Hall County states that municipalities can condition zoning approval on actions by the developer that, first, further the health, safety, or welfare of the citizens; and second, address any harms caused by the development itself. Therefore, some provisions in a CBA might meet those requirements and could also appear as zoning conditions; and others might not. Further, to move forward on a zoning decision without seeing what the community might first negotiate precludes the identification of meaningful zoning conditions that promote the public policy goals of the City. Residents asked Councilman Young and the developer to continue to defer any final zoning and land use approvals. After Thursday’s meeting, Rep. Thomas and developer deFoor tentatively agreed to have a bilateral meeting. It was discussed that this meeting might take place as early as this weekend, but it is not immediately clear whether that meeting has been scheduled. Editor’s note: Superimposition of Grumpy Cat image does not necessarily imply endorsement of article by Grumpy Cat. APN does not own rights to Grumpy Cat image, which is superimposed on original APN image for satirical, edu-“cat”-ional, and other fair use purposes. What are the democratic party, the churches, the unions doing about these citizens. Are their any alternative buildings suggested?? Love the angry cat watching the developer. housing…for cops, teachers & fire fighters” then all of a sudden the jargon changed to “Affordable Housing”. Westside” if development isn’t adequately planned. under the new metrics. Photos available on-line. the idea of roof top solar panels &/or drainage systems for roof top gardens.